There are many factors and materials to take into consideration when dealing water damage to a structure. One of those factors that determine the best course of action after experiencing water damage is the sub floor. Sub floors, based on their material make up, vary greatly in how they respond to water and in turn how the react to being dried out via water extraction. A general rule of thumb is that the faster the sub floor material absorbs water the more damage it sustains during a flood – particle board will become irreparably damaged much quicker than plywood. Drying is done through evaporation and can be drastically accelerated when proper drying principals and equipment are used. The type and composition of sub floor material will play a large part in whether drying is appropriate or not. Water damaged concrete slabs vary greatly in their porosity due the materials used, any finishes applied or sealants added once cured. A concrete slab can be quite something to dry and pose all sorts of problems for restoration companies in certain situations. Stress cracks in the concrete slab can also pose problems on their own because water seeps under the slab and can be very difficult to dry. Some areas have very high water tables and can pose another issue to restorers who are trying to dry the concrete slab back to a dry standard or reasonable moisture content. The wet concrete slab may have absolutely nothing to do with the original water loss, but because of underground water can really create some headaches especially if it was incorrectly constructed in the first place. In most cases when concrete gets wet following a water damage loss and a restoration company can respond with the first 72 hours following the loss the concrete slab can be returned back to its correct (original) moisture content. 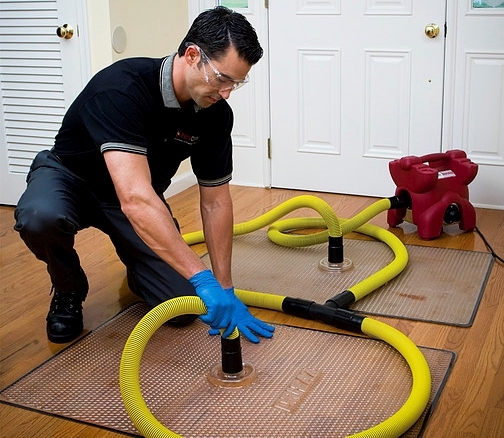 As long as the restoration company performs extraction and then creates a stable drying system using dehumidification promoting optimal evaporation then the concrete slab will dry quick enough to prevent any further issues. Furthermore, concrete slabs don’t typically support mold growth because they tend to not contain any organic materials, they’re alkaline in nature and tend to remain cool when wet. 1 – LGR dehumidifiers or desiccants: When these dehumidifiers are coupled with adequate air movement, the humidity levels in the room can drop dramatically and promote fast evaporation from the concrete substrate. Sometimes it’s recommended to tent the floor and duct the dehumidified air into the tenting (over 1-2 vertical feet) so as to reduce the humidity in the tent as opposed to the whole room (which could be anywhere from 8 – 20 feet in height alone). This process of tenting can drastically reduce the drying time. Keep in mind if the concrete slab is laid over wood flooring it’s a good idea to also dehumidify the air in the crawlspace too. 2 – Drying with hot air: Hot air is another way to dry this type of sub floor makeup. Since hot air tends to have a low relative humidity (regardless of actual humidity) it encourages evaporation by exciting the water molecules absorbed into the sub floor and increases the rate of evaporation. The air increases in relative humidity as it absorbs the released water molecules and is exhausted to the outside or dehumidified before it cools again. OSB falls somewhere between plywood and particle board in the damage water can cause and how it responds to effective drying methods. OSB can be damaged very easily by prolonged water exposure and can lose its strength quite quickly, however if the water damage is caught quickly OSB can be saved because it doesn’t swell and become distorted as quickly as particle board. OSB also dried quicker than plywood because of its makeup. Badly water damaged OSB should be replaced. Replacing wet particle board could be more cost effective rather than attempting to dry it, however it can be done if caught quickly enough and it hasn’t swollen yet. Particle baseboards tend to swell and distort rather quickly due to their resin composition and removing them to expose the walls and replacing them with new ones later is a much better approach when trying to return the home to a pre-loss condition. Our restoration company will inspect particle board very closely and make the determination whether to try and save them or simply replace them. If plywood sub floors have been wet for less than 72 hours they can be saved with water extraction and the correct drying procedures (dehumidification and air movement). If plywood has been exposed to water for longer than 72 hours it needs to be a judgment call on whether they can be saved or not. Plywood varies based on the glues used to bond the layers together and some plywood is a lot more porous than other which increases water absorption and hence damage, but on the other hand can also dry quicker too. Once the plywood sub floor is dry it should be inspected for further damage before laying the finished flooring down over it. I was a little overwhelmed when our basement flooded. My insurance adjuster recommended PuroClean Certified Restoration. Not only did they complete their job in a fast and professional way, but they did so with a caring and empathetic way. I recommend them for any issues that they service. - John T.
I'm a Realtor. They just finished work on one of my listings. GREAT JOB! I would highly recommend them. - Eileen P.
The Best Choice For Water Damage Restoration in Springfield MO is PuroClean Certified Restoration. Website Design By Calibrate Marketing.